Phones, laptops, electric cars - batteries are everywhere. And to meet the expectations of today's consumers, these batteries are increasingly light, more powerful and designed to last longer. Currently the most important technology for these applications is the lithium-ion battery technology: but the technology is expensive and contains a flammable liquid, which may represent a safety hazard, when the battery is abused. To satisfy the growing demand from emerging markets (electric cars, for example, and renewable energy storage), researchers from Empa, the Swiss Federal Laboratories for Materials Science and Technology, and the University of Geneva (UNIGE), Switzerland, have devised a new battery prototype: known as "all-solid-state", this battery has the potential to store more energy while maintaining high safety and reliability levels. Furthermore, the battery is based on sodium, a cheap alternative to lithium. The study is published in Energy and Environmental Science. For a battery to work, it must have the following three key components: an anode (the negative pole), a cathode (the positive pole) and an electrolyte. Most of the batteries used in our electronic equipment today are based on lithium ions. When the battery charges, the lithium ions leave the cathode and move to the anode. To prevent lithium dendrites forming - a kind of microscopic stalagmite that can induce short circuits in the battery that may cause fire - the anode in commercial batteries is made from graphite rather than metallic lithium, even though this ultra-light metal would increase the amount of energy that can be stored. The Empa and UNIGE researchers focused on the advantages of a "solid" battery to cope with the heightened demand from emerging markets and to make batteries with even better performance: faster charging together with increased storage capacity and improved safety. 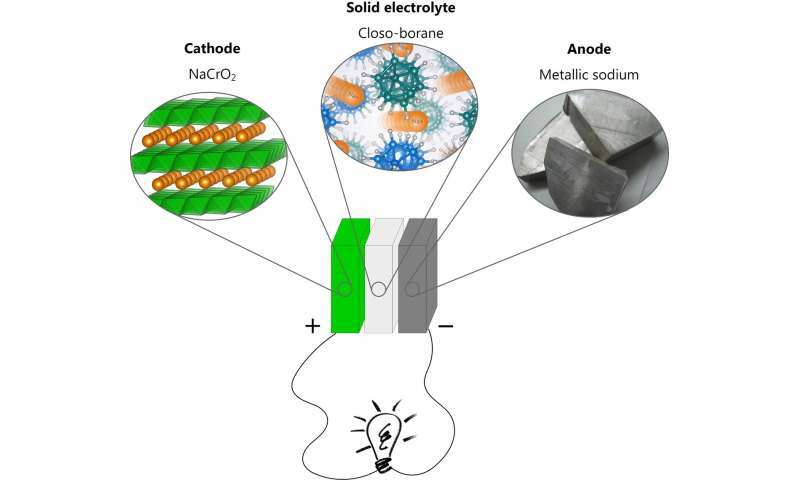 Their battery uses a solid instead of a liquid electrolyte that enables the use of a metal anode by blocking the formation of dendrites, making it possible to store more energy while guaranteeing safety. "But we still had to find a suitable solid ionic conductor that, as well as being non-toxic, was chemically and thermally stable, and that would allow the sodium to move easily between the anode and the cathode," explains Hans Hagemann, professor in the Physical Chemistry Department in UNIGE's Faculty of Sciences. The researchers discovered that a boron-based substance, a closo-borane, enabled the sodium ions to circulate freely. Furthermore, since the closo-borane is an inorganic conductor, it removes the risk of the battery catching fire while recharging. It is a material, in other words, with numerous promising properties. "The difficulty was establishing close contact between the battery's three layers: the anode, consisting of solid metallic sodium; the cathode, a mixed sodium chromium oxide; and the electrolyte, the closo-borane," states Léo Duchêne, a researcher at Empa's Materials for Energy Conversion Laboratory and a PhD student in the Department of Physical Chemistry at UNIGE's Faculty of Science. The researchers dissolved part of the battery electrolyte in a solvent before adding the sodium chromium oxide powder. Once the solvent had evaporated, they stacked the cathode powder composite with the electrolyte and anode, compressing the various layers to form the battery. Researchers at Empa and UNIGE subsequently tested the battery. "The electro-chemical stability of the electrolyte we are using here can withstand three volts, whereas many solid electrolytes previously studied are damaged at the same voltage," says Arndt Remhof, a researcher at Empa and leader of the project, which is supported by the Swiss National Science Foundation (SNSF) and the Swiss Competence Centre for Energy Research on Heat and Electricity Storage (SCCER-HaE). The scientists also tested the battery over 250 charge and discharge cycles, after which 85% of the energy capacity was still functional. "But it needs 1,200 cycles before the battery can be put on the market", say the researchers. "In addition, we still have to test the battery at room temperature so we can confirm whether or not dendrites form, while increasing the voltage even more. Our experiments are still ongoing."